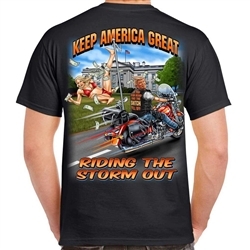 Funny men's black cotton biker t-shirt with one of a kind graphics, Donald Trump riding a motorcycle with Stormy Daniels falling off the back. Trumps shirt reads "If you can read this the snitch fell off" "Riding out the storm". 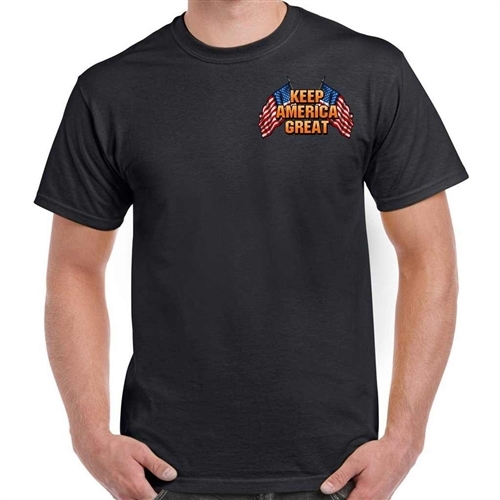 Your sure to make a statement with the Keep America Great graphic on the front chest with American Flags. Shirt arrived quickly and was exactly as it was described on the site. Very colorful! Great company. Quick shipping and excellent products. Will definitely order again.